Helmets, usually the most expensive part of a costume, can be easily made with flexible cardboard in little time. The leaders of the Greek armies displayed elaborate helmets as part of their suit of armor. 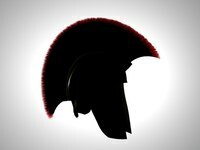 King Leonidas, leader of the Spartans, used the hair of a horse as the crest of his helmet. Decorations added to a cardboard costume helmet will turn the ordinary cardboard into a king's elaborate headpiece. Trace the head of the wearer using a strip of the flexible cardboard. Tape the measured head circumference strip together at the ends. This will serve as an interior ring and base for your helmet. Use the batting helmet to shape the cardboard piece. Cut out pieces of cardboard as needed or flex the entire piece of cardboard over the top of the batting helmet to mold the cardboard into helmet shape. Tape pieces of cardboard together until you have a shape similiar to a helmet. The tape will not be seen when finished. Attach the ring of cardboard to the inside of the helmet shape using the transparent tape. Place on the head of the wearer to ensure a proper fit. Make adjustments to the inner ring at this point by loosening the tape that holds the ring together or tightening the ring strip. Cover the entire cardboard helmet with strips of silver duct tape. Make long strips and wrap underneath the inside of the helmet. Flip over and cover the inside of the helmet with duct tape, including the ring. Get an unused long cleaning brush and cut off the bristles at the base of the brush. Lay a strip of duct tape onto a table face up. Place the bristles on the strip and gently fold the duct tape strip around the bottom of the bristles. Duct tape this crest to your helmet.